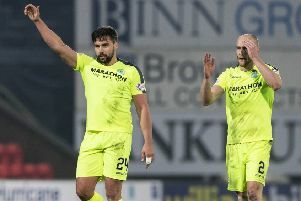 Striker James Collins today laid down the gauntlet to Hibs’ relegation play-off rivals, urging the chasing pack to catch the Easter Road side if they can. The 23-year-old Irishman, who also insisted the club are not involved in a relegation battle, believes the Hibees have enough at their disposal to keep the clubs beneath them at bay and finish best of the rest in the bottom six. Despite the 2-0 defeat by Aberdeen on Monday night, a result that prompted manager Terry Butcher to declare the club have now become embroiled in a relegation fight, Hibs continue to occupy seventh spot in the table. But Collins, who led the line against the Dons after Paul Heffernan suffered a groin injury in the warm-up, said: “We’re in the best position out of the six and yes we have dropped points and teams have caught up, but we’re confident that we are going to easily beat the drop. “We’re in the bottom six but I don’t think we’re really in a relegation battle as we’re still top of the pile. It’s in the final third that we’re lacking at the minute but we’ve got a break to get it sorted on the training pitch and then away to St Mirren next weekend. Hibs have accumulated the lowest goal tally of the 12 Premiership clubs, 29 goals in 33 matches and just one in their last five. Collins has struggled to find the net regularly since his move north of the border last summer with a return of just six for the season, but he alluded to former talisman Leigh Griffiths’ record of eight when he first joined his boyhood heroes on loan from Wolves in 2011.